Smoothies are a delightful way to boost your health while enjoying a myriad of flavors! I enjoy a nice green salad and often will even add a few sliced strawberries, diced pineapple, or perhaps raspberries and blueberries strewn across the top. A smoothie can be a good snack or an entire meal, in itself. And while I love snacking on whole fruit, I find that a cool blended smoothie is sometimes just what I need to energize me for the day. We live on an organic farm, so my smoothie choices are often decided by what we have available at the time. Strawberries dominate during the season, while blueberries follow a couple of months later. I also keep some of those delicious fruit choices frozen to add during the off season. Our farm is in central Florida where, with a little ingenuity, greens can grow year round. As such, kale and spinach often dress my smoothies in a beautiful green color, while adding anti-oxidants, vitamins, and minerals. For those in the more variable states, you might consider canning or freezing your favorites to enjoy smoothies year round, or shop where a variety of organics are readily available year round. These 16 smoothies will give you a few to try–let me know which are your favorites! 13. Island Green Smoothie | Source: Is This Really My Life? 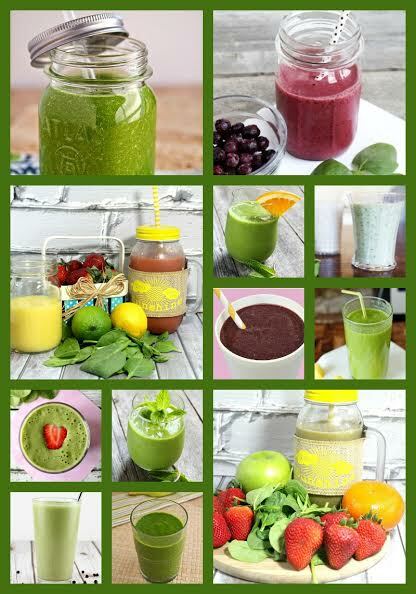 Thanks for this great list of smoothies! I’m all for spinach in smoothies! These all look great, what does spinach not go with? I have always used kale in my smoothies. I am saving this to my computer and will be trying a few out! I will have to let you know what my taste buds say.